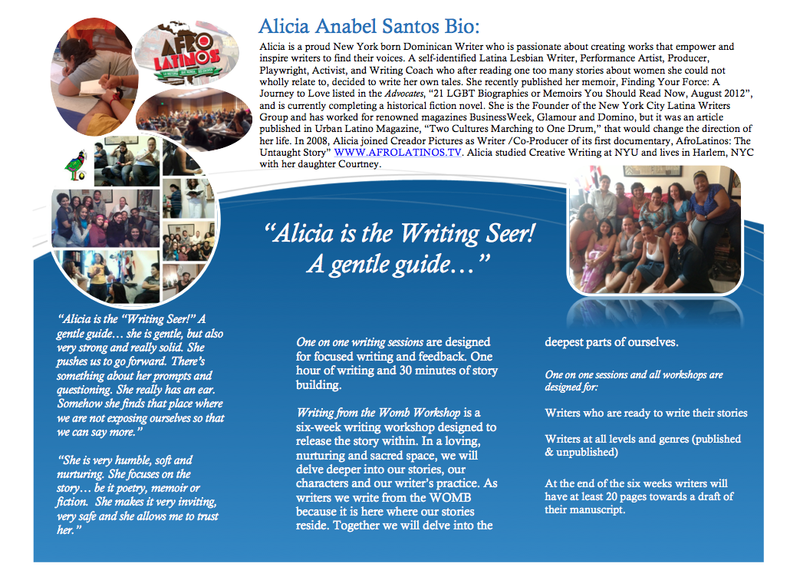 For over ten years I have facilitated many writing workshops, curated showcases, and have spoken at some of the largest universities all over the United States and Latin America. Over the years I have discovered that the support, encouragement and sacred space I have created and provided for many writers here in the New York City is expanding. I am expanding and growing. 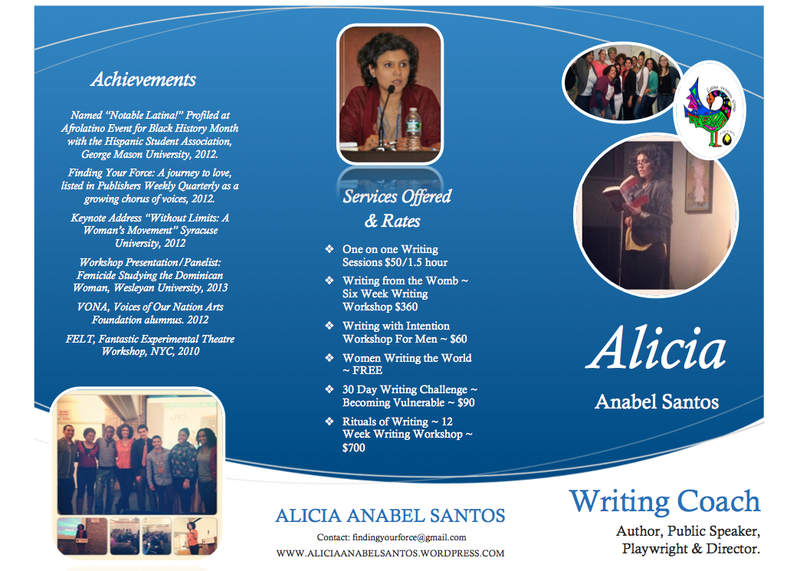 With that growth I am incredibly excited to officially launch the Alicia Anabel Santos, Writing Coach & Workshop Page. I am branching out to areas where writers might feel that they are alone. What you will quickly learn is that you are never alone. I am a phone call, Skype, Google chat or face-to-face writing session away! I hope that this announcement arrives in your life RIGHT ON TIME and in the moment you NEEDED IT MOST! There is a story you were born to tell and I was born to get you there! Writing requires a tremendous amount of trust… trust in your ability, trust in your characters, trust in your story and trust in yourself. I do not come at this task lightly, in fact, it it with a tremendous amount of respect, patience, love and humility that I will guide you! Take my hand… you don’t have to do this alone! Last day to register November 1st ~ payment will be accepted at the first session. Out of state: Writers are able to dial-in! Last day to register November 2nd ~ payment will be accepted at the first session. Reserve your seat – limit 12 writers. 30 Days to Becoming Vulnerable!